The sign of the gang was a blood-red glass serpent-shaped ring! The city is beset by a new gang. With prohibition repealed, crooks are looking for new vices to exploit. They have found it in the deathly white drug they are calling “joy powder.”With this gang, you are either with them or you are dead or drugged. Many addicts had never before taken any sort of narcotic. With the “joy powder,” one forced injection is enough to make you its slave. The gang has a long reach. They have infiltrated the police department and brag openly that the cops are their friends. Stanley Kirkpatrick has been framed for taking bribes. The disgraced police commissioner turns to Richard Wentworth for aid in fighting a losing battle. 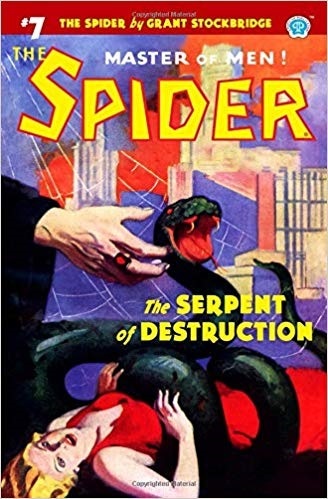 The leader of this gang is referred to by his cronies as “the bloody serpent.” A scarlet glass ring in the shape of a serpent is a calling card that rivals the Spider’s crimson signature. The gang decides that to cripple Wentworth, whom they know is the Spider, they will kidnap Nita and give her a dose of the “joy powder.” If the Spider doesn’t back off, Nita will become an addict. They should have known not to provoke the violent knight; to cross the Spider is death! Fans of the old pulp heroes will enjoy these stories very much. I give it five stars.